In Mighty Adventuring Hero you take on the role of an incredibly competent individual with all the best personality traits and absolutely no weaknesses. That’s what you like to tell yourself, anyway. Normal people tend to think of Adventurers as completely expendable idiots who barely understand which end of the sword you’re supposed to hold. They also think that sending them out on incredibly dangerous quests is far better than being robbed blind by unemployable maniacs, so there’s really no end to the adventures to be had. Despite the general cynicism, the most successful Adventuring Heroes will gain piles of gold, glory, and—most importantly—the recognition of an adoring public. Kick down doors! Swing on chandeliers! Hum your own personal theme song! Showing off and not taking deadly combat seriously has never been so much fun! 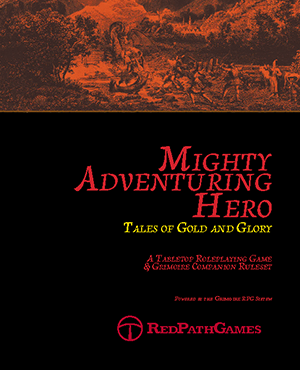 Mighty Adventuring Hero – Tales of Gold and Glory is available in Hardcover, Paperback and PDF. Players describe what they want to do, and the heroic manner in which they’re doing it. Game Masters match the actions to the highly flexible Heroism System. Whether you prefer playing as bold heroes of destiny, greedy adventurers-for-hire, or brave children entering a dark and terrible world of magic and monsters, Mighty Adventuring Hero has you covered. The guidebook contains tables for randomly generating your Adventuring Heroes and their adventures. Generate quest details, magical artifacts, dreaded dungeons, and their dark and troubled pasts. Empowering, dramatic music is an important part of any important adventuring moment. Use music and song to give characters an in-game bonus. Stealth can only improve when your bard is singing about how quiet your movements are! Make sure your players know every Hero’s name and just what makes them so very impressive with eye-pleasing paper badges they can decorate and tape to their shirts. Creatures of the Magical Worlds are exceptionally dangerous, but the monster guide will give important information on how they might be encountered and how to deal with them.